A lone and obscure company purchased nearly all the public-lands leases the Bureau of Land Management auctioned on Tuesday in an area blanketed with prehistoric structures, rock art and other artifacts left by Ancestral Puebloan cultures. Acting on behalf of Ayers Energy LLC, a Texas lawyer named Jeremy Westphal submitted the winning bids, totaling $715,168, on 19 of the 21 parcels the BLM sold on lands east and south of Blanding, according to the BLM’s summary of the online auction. But who or what is Ayers Energy? The firm, which reported an address in Cheyenne, Wyo., does not appear in public corporate-registration databases in Utah, Wyoming and Texas. There are signs Ayers could be a straw buyer, acquiring the leases on behalf of a third party. A voicemail and texts left at a phone number associated with Jeremy Westphal, who is listed as a member of the State Bar of Texas, were not returned. Adding to the mystery, other documents filed with the BLM list a Zachary Westphal as representing Ayers. Ayers and Jeremy Westphal have not participated in a BLM oil and gas auction for at least the past three years in Utah. Nor do state oil and gas regulators have any record of either seeking to drill. 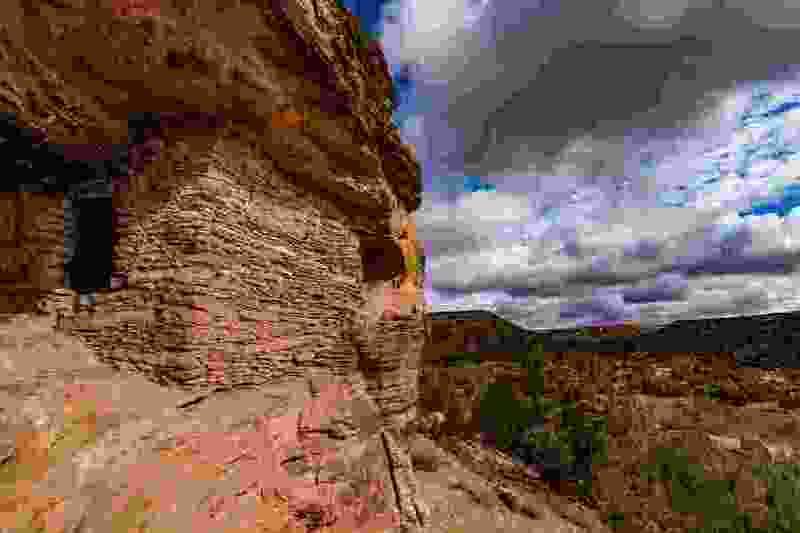 Yet Ayers could soon hold drilling rights on 27,475 acres covering Utah’s Montezuma and Recapture canyons, Mustang Mesa and Alkali Ridge — “a cultural landscape” that preservationists hope to see managed for its archaeological treasures. Tuesday’s sale drew criticism from several groups, including the National Parks Conservation Association, the National Trust for Historic Preservation and Southern Utah Wilderness Alliance. The BLM initially provided Jeremy Westphal’s home address in Bedford, Texas as Ayers’ headquarters. It later amended the company’s location to an address in Cheyenne, Wyo. that is occupied by Wyoming Registered Agent, a firm that stands in as a third-party corporate agent. A person who answered the phone there said her firm does not represent Ayers, but that it could be represented by another corporate agent that sublets office space in the same building. Tuesday’s lease sale highlights a lack of public access to information surrounding federal oil and gas auctions, leaving it difficult to gauge the seriousness or legitimacy of bidders buying up rights to drill on U.S. public lands. A year ago, the BLM switched from live auctions conducted in person to a system of online sales which leaves members of the public with no way of seeing who is bidding. Critics of the process note that the BLM lease auctions involve publicly owned assets and that selling them contractually obligates to the BLM to manage the lands for 10-year terms in ways that make oil, gas and mining development a priority. The Department of Interior has hailed the online sales process as a step toward greater efficiency and transparency, but so far, some critics say, transparency has been lacking. The BLM would not immediately provide the Tribune the contact information that Jeremy Westhphal submitted when he registered to bid with third-party online auctioneer EnergyNet.com. Bidding data later provided by the agency indicated that a Zachary Westphal, instead of Jeremy, was the actual bidder. No additional information was immediately available on Zachary Westphal, whom the BLM is now trying to verify was a qualified bidder. Some of the parcels Ayers sought sold for just a few dollars an acre, but others went as much higher prices, often $40 or $50 an acre — evidence that bidding was competitive. That hasn’t been the case in recent auctions, particularly those held over the last year in Nevada and Montana. Tuesday’s Utah auction, covering only Grand and San Juan counties, was unusual in that all 43 offered parcels sold, all but one attracting bids exceeding the $2-an-acre minimum. Ayers failed to win the bidding on only two parcels in the archaeologically rich area, and those sold for more than $90 an acre, suggesting the firm had a limit on what it was willing to bid. Those high bidders were Lane Lasrich of Sandy and Contex Energy Co., an established industry player in Denver. Also active in Tuesday’s bidding was Wasatch Energy Management LLC, which bought 15 leases, many next to or near the former northern boundary of Bears Ears National Monument. The bidding data from the auction indicate Ayers competed mostly with Context and Lasrich for the leases. Both Lasrich and Wasatch Energy principal Daniel Gunnell of Orem are regular participants at BLM’s Utah auctions, with a history of buying leases in sensitive areas that conservationists and historic preservationists don’t want developed. But neither has an extensive track record of actual drilling. In contrast, Jeremy Westphal is a blank slate. Documents indicate he did form a company called Westphal Energy LLC in Salt Lake City, but Utah Department of Commerce records say it was dissolved in 2013. The BLM rules require that bidders have an ability to buy the leases; not be in default on obligations to the federal government; and that they intend develop on the lands they lease. Would-be lessees also must sign an agreement that they are engaged in the energy business “on an ongoing basis” and have not formed a corporation for the specific purpose of bidding on and acquiring leases. A BLM spokesman said the agency has 10 days from the sale to ensure payment has been made and Ayers is a legitimate lessee. Ayers also owes $41,000 in annual rent on the leases. Conservationists’ attempts to acquire BLM leases on sensitive lands in Utah have not gone well. The BLM shut down such buyers because they didn’t have the ability to pay for the leases, as was the case for Tim DeChristopher, or had no intention to develop them, as was the case of Brooke and Terry Tempest Williams, who paid for two leases in February 2016. DeChristopher famously went to prison for disrupting a 2008 auction with phony bids, while the Williams are appealing the BLM’s refusal to issue the leases they bought.